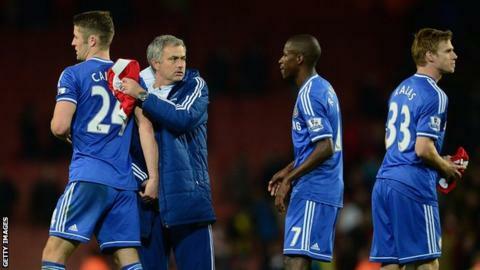 Chelsea defender Gary Cahill says Jose Mourinho has the full support of the players to turn things around. The Blues have made a disappointing start to their Premier League title defence, having won just two of their first eight games. Mourinho has been backed by Chelsea owner Roman Abramovich and Cahill says the players are also behind him. "We are all around him," Cahill, who will captain England against Estonia on Friday, told BBC Radio 5 live. "Dare I say he doesn't even need backing when you have done so much in the game, not just at Chelsea but in other leagues too. "It is obviously nice to have that and he certainly has it from the players and the club." This has been Chelsea's worst start to a top-flight season since 1978-79, and last Saturday's 3-1 defeat at home to Southampton was their fifth loss of the season. "The Southampton game for me personally was a real low," added Cahill, who will take over as captain from the injured Wayne Rooney for England's final two Euro 2016 qualifiers against Estonia and Lithuania. "I have come away here totally determined to make it right when I get back."